Today is Día de los Angelitos, a special day connected with Día de los Muertos to remember children who have died. I’m grateful that such a beautiful tradition was created and I share in it with reverence. We put together an ofrenda for Ellis that includes many special things we’ve collected—a onesie that Hunter and I bought when we learned we were having a boy, his 20-week ultrasound image, the hospital blanket he was wrapped in, castings of his hands and feet that our doula made, a crystal that a friend gave us, and cardboard rainbows made by my cousin’s kiddos. Growing up in San Antonio gave me a familiarity with Día de los Muertos, though I never participated in creating an ofrenda. A couple weeks after Ellis died, Hunter and I watched the movie Coco, which beautifully depicts the traditions and beliefs of the Mexican holiday. 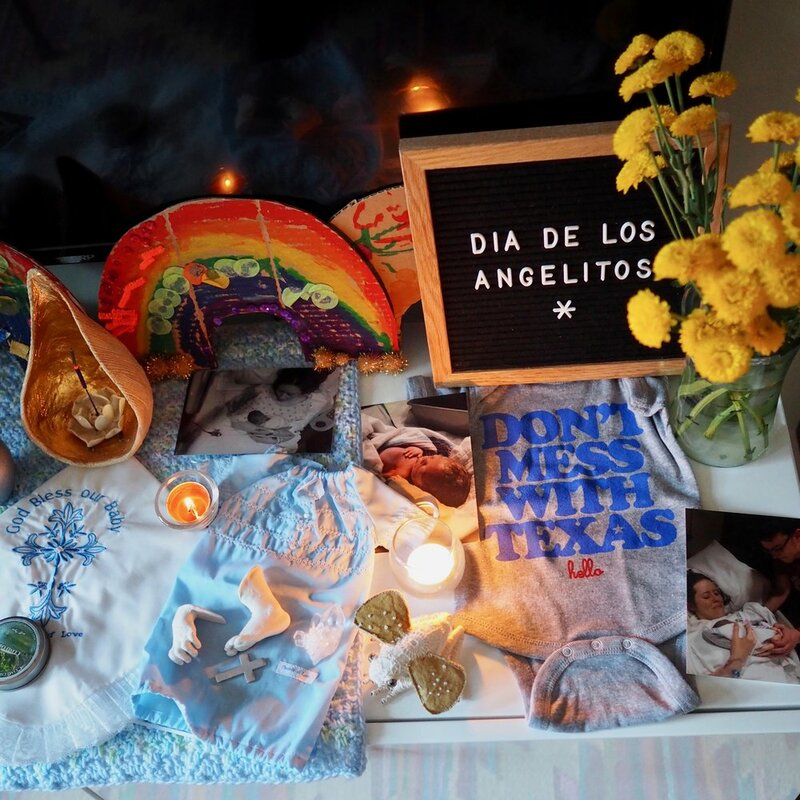 We were so moved by the movie’s song “Remember Me” (I ugly cried) that we decided to make an ofrenda for Ellis this year. During those weeks after his death, our whole house was like an altar filled with flowers, cards, mementos, photos, and food. Visitors came by to contribute something and also hear Ellis’ story told through the objects displayed. We were wrapped in love and light from his presence. Eventually, after about six weeks, we began to pack everything away and get our house back to “normal”. Setting up a new altar this week made us feel his presence again. It was so cathartic to open his memory box and hold each object. This experience invited my tears back to the surface and, though I’ve never been a person who cries easily, I’m learning the importance of letting them flow when I feel the need. I understand that Día de los Muertos is about celebrating life and also acknowledging that death is an important part of it. We are using this time to reflect on all the gifts that Ellis has given us in his short life and death—the gift of becoming parents and participating in the magic of creation, the gift of seeing how much love we have all around us, the gift of finding strength in our weakness and vulnerability, and the gift of knowing how darkness and light are inexplicably intertwined.